♥ These cute chubby bird earrings are a unique One Happy Leaf design that's been laser cut onto honey brown bamboo wood. ♥ Birds are 0.6 inches (1.5cm) in length on surgical steel studs (to protect sensitive ears). 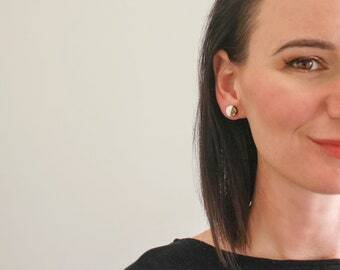 ♥ The edges of the earrings are "burnt" to give contrast to the lovely grained bamboo. ♥ These super cute earrings are perfect for a sweet gal to wear on a day out with the girls for tea and cupcakes! One Happy Leaf is committed to making the world greener. For every order placed, we plant a tree through the Foundation for the National Parks and Wildlife or the Nature Conservancy. I hope you enjoy the quality and eco-friendly properties of your One Happy Leaf jewelry! If you have any questions, please feel free to contact me. 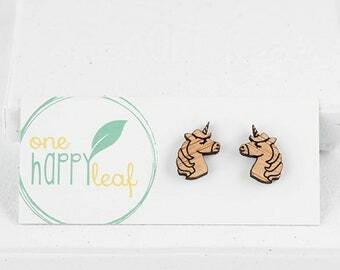 Unicorn earrings - unicorn jewellery, unicorn gift, unicorn stud earrings. Unique laser cut wooden jewelry. 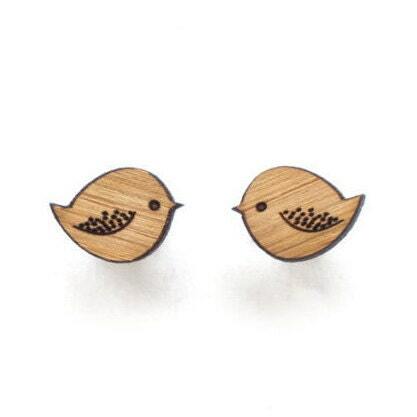 Bird earrings - wooden eco friendly wood bird studs. Unique laser cut wooden jewelry. Studs are super cute, exactly how they are in the pictures. I recieved them 13 days after I ordered them: very fast considering they have come a long way. Beautiful, simple and great quality. Great! I love it! Exactly as described. Yes, I offer an express shipping option for Australian delivery addresses. Please select "express shipping" to receive your goods within 1-2 business days. All jewellery pieces are placed within eco-friendly boxes (except hair pins, which are placed within a cotton bag). Our boxes are made from recycled paper collected in the beautiful developing island of Bali in Indonesia. The small business employs the local women from the surrounding villages to provide them with employment and a safe place to work. Can I have a custom order created? What do you do with the profits of your business? A portion of One Happy Leaf profits are used to plant trees! I believe in a greener future for the world and therefore funds are used to plant trees in areas requiring rehabilitating to encourage biological diversity and create homes for endangered animals. How can I come a VIP customer of One Happy Leaf? You can join our Happy People Society to be kept up-to-date about new designs and secret VIP sales. Just cut and copy the link: https://www.onehappyleaf.com/pages/subscribe-to-happy-mail into your browser and complete the 10 second sign up form. Can I get tracking of my parcel? Yes! Just add tracking at checkout to your shipping requirements. You will need to select "tracking of parcel" at check out.